WASHINGTON -- The national sense of outrage swiftly passes. That's the lesson of American gun tragedies past. In January 2011, Rep. Gabrielle Giffords (D-Ariz.) barely survived being shot point-blank in the head by a man who emptied his 30-round magazine into 19 people, killing a federal judge and five others. It's hard to imagine an incident that would be more likely to advance the cause of gun control in Washington. But nothing happened. President Barack Obama called for a national dialogue, but didn't lead one. Gun-control Democrats proposed banning high-capacity clips, like the ones Giffords' shooter used, but their bills went nowhere. The gunman who opened fire in an Aurora, Colo., movie theater Friday morning, shooting 71 people and killing 12, is said to have been armed with two handguns, a shotgun and an assault-style rifle, some of which were presumably equipped with high-capacity clips. "There were many, many rounds fired," Aurora Police Chief Dan Oates said at a Friday press conference. "We know there were a lot of rounds fired very rapidly." Gross agreed. "That's the arc that these things always take and they know it," he said. But, Gross said, the "now is not the time" argument would only be genuine "if history showed that there ever is a time to discuss the role of gun policy in preventing these tragedies." And Rand said it's appropriate to start talking about solutions right away. "It's not politics, it's public health," she said. "You have an industry that manufactures a product that is completely unregulated from a health and safety standpoint." Rand explained: "Firearms are consumer products. If this were some other consumer product -- if this were an airplane crash, or some major car crash, or poisoned food -- people would say, 'Okay, let's look at how we prevent this from happening again.' It's only when it's guns that people say 'it's too early.' It's like if the NTSB [National Transportation Safety Board] couldn't go out to the site of an airplane crash because the families are still mourning." The powerful National Rifle Association -- which opposes any restrictions on gun rights -- is lying low for now, the Washington Examiner reported. “Our thoughts and prayers are with the victims, their families and the community," an NRA spokesman told the Examiner. "NRA will not have any further comment until all the facts are known." 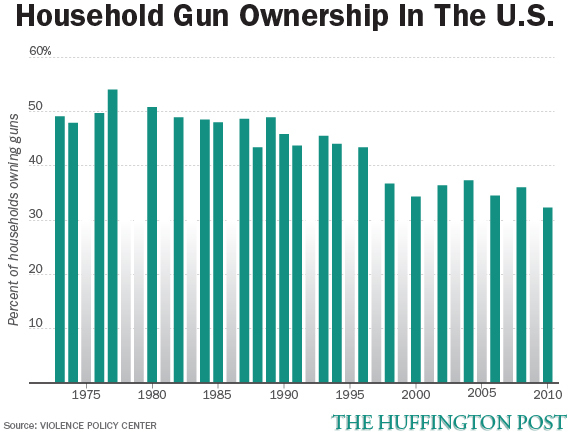 But many politicians fear of the NRA -- even though it may be in decline. "I think the problem is that we have politicians making calculations based on how much political pain they're going to receive from certain votes on the gun issue, not on the pain that gun violence is causing American families and communities," said Ladd Everitt, the director of communications for the Coalition to Stop Gun Violence. A few politicians responded to Friday's tragedy with a call for conversation, if not action. Chief among them was New York Mayor Michael Bloomberg, who said in a radio interview: "You know, soothing words are nice, but maybe it’s time that the two people who want to be President of the United States stand up and tell us what they are going to do about it, because this is obviously a problem across the country." Obama did not talk about ways to address the problem in his statement Friday morning from Fort Myers, Fla. Despite being an outspoken advocate of tougher gun measures earlier in his political career, he has almost never raised the topic as president. In March 2011, two months after the Giffords shooting, Obama wrote an opinion column in the Arizona Daily Star. "Our focus right now should be on sound and effective steps that will actually keep those irresponsible, law-breaking few from getting their hands on a gun in the first place," he wrote. The only concrete step he proposed was to focus on background checks. White House spokesman Jay Carney was asked Friday about the president's view on gun laws in the wake of the latest shooting. "I would say, as you know, the president believes we need to take common sense measures that protect the Second Amendment rights of Americans while ensuring that those who should not have guns under existing laws do not get them," Carney said. "We're making progress in that regard in terms of improving the volume and quality of information on background checks but I have nothing additional on that for you." Gross said he doesn't blame Obama -- or Republican presidential candidate Mitt Romney, an avowed gun advocate -- for their expressions of sympathy. "What I blame them for is what they've done leading up to today," he said. "The president called for a national dialogue on the gun issue," Gross said, "but has not asserted his voice or leadership in that dialogue." He said he hopes this time will be different. "We cannot allow this tragedy to just dissipate without underscoring the undeniable link between guns in our country and gun violence," Gross said. "We have to coalesce that anger and outrage and harness it for the purpose of demanding answers and demanding solutions." 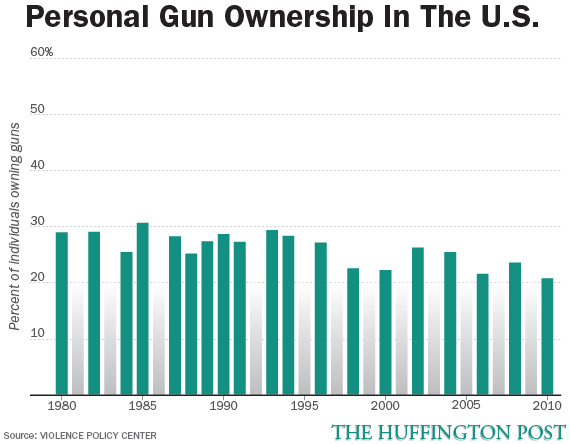 See below graphics for some stats on U.S. gun ownership over the years.